The most important Madison Metropolitan School District Board of Education meeting this “week” is Sunday’s Budget Hearing (April 18th at 1:00 pm at Warner Park Community Recreation Center — 1625 Northport Dr). Read more about it and some calls for action here. 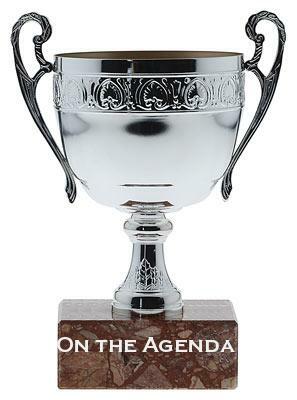 An extra meeting prior to Monday’s District Awards Ceremony has been called to wrap up some loose ends and possibly move budget matters forward. The meeting commences at 5:30 and the Award’s Ceremony is scheduled for 7:00. Here are the details: Memorial High School, 201 South Gammon Road. Madison, WI, Room 500. As of last Monday, it appeared that MMSD-TV would be covering the Ceremony, but not the meeting. If I hear different, I’ll post. The first item on the agenda is “Position Descriptions for Deputy Superintendent/Chief Learning Officer; Director-Professional Development; Director-Early and Extended Learning; Executive Director of Curriculum and Assessment” and this comes with some new information, as requested by the Board. The related documents are: Position Descriptions; Organization Chart; and an updated Reorganization Budget (what was previously presented as the Side-by-Side). There are a couple of other related items that have been received by the Board but do not appear to have been posted yet on the district site. The first is a new memo on the Reorganization from Superintendent Dan Nerad. The second is a new version of the Department and Division Reports portion of the Budget Book (old version here), with at least some of the Reorganization interpolated in Budget Figures but not in the narratives or organization charts. I haven’t had the time to do a page-by-page, so I’m not sure what has been changed or what still needs changing. I am sure that the that the “Proposed Expenditures: Summary by Department” reflecting the Reorganization (beginning on page 5 new Department and Division Reports pdf), along with the Reorganization chart, is very useful in getting a handle on both the Reorganization and the budget. Some things to note from this set of documents. First, there are lots of vacancies in important positions and not all are Reorganization related. This brought to mind that Arlene Silveira and Lucy Mathiak, now poised to begin their fifth years of service, are the longest serving Board members. Maybe we were spoiled and some may say that turnover is good, but there does seem to be a deficit of the kind historical memory that long-serving Board members and administrators provided. I’ve been trying to figure out the new Talented and Gifted arrangement. Direct supervision of the Coordinator is split between Elementary and Secondary Assistant Superintendents (serve two masters?) and I think the budget lines for the TAG IRTs appear as Elementary Bldg Support and Secondary Elementary Bldg Support. Talented and Gifted is one area where the narrative has not been updated in the new documents. I also want to repeat three things. 1) This Reorganization seems to me to also change the job description of the Superintendent and that remains unexamined. 2) There has been some complaining about adding the Chief Learning Officer position at a time of budget difficulties, but the salary and benefits lines for that position replace the Chief of Staff and only add about $6,000 in projected expenditures. 3) The matter of using Fund Balance money to pay for the remaining contracts on eliminated postilions remains unresolved and the larger discussion of best practices on Fund Balances and debt refinance that I’ve been calling for the last year and a half does not appear to be part of the plan. The next item is the “Legislation relative to the Student Achievement Guarantee in Education (SAGE) Program.” This really deserves a post of its own as a state matter, but that hasn’t happened. I did write a long comment and I’m going to cut-and-paste that and add some things. The biggest thing missing from this comment is the part of the legislation that I think makes SAGE contracts available to more schools. I believe MMSD has 19 contracts and 25 elementary schools with poverty levels above 30% . If I read this correctly, the six non-SAGE, 30%+ schools would be eligible (MMSD used to do fully locally funded class size reductions for non-SAGE schools, but that fell under the budget axe three years ago). Expanding SAGE to more schools would be a good thing, but one with budget implications, requiring more local money too. I also neglected to mention that coupled with the new 18/1 policy is the elimination of the DPI power to grant waivers. MMSD has registered in opposition to this portion of the legislation. A quick recap of the economics of SAGE and this proposal is probably in order (fuller ones in this post and this one). SAGE is underfunded and the lower the poverty percentage in a school/grade/class, the more underfunded it is. You have to get in the 90%+ poverty range for state funds to fully cover the costs of lower class sizes. The class size limits also create sweet spots and sour spots. At 15, 30 or 45 (or any multiple of 15) is a sweet spot where SAGE dollars are maximized and local dollars are minimized (at 18 it would be 18, 36, 54…). The sour spots are all other numbers, but especially those just over the multiples of the limits. Under current law 30 kids in a grade means two classes but 31 means three classes. That’s a sour spot. raising the limit gives more flexibility and makes many of the sour spots less sour (under the new limit of 18, 31 kids wouldn’t be the sweetest spot, but it wouldn’t require a third class either). As a general thing, I like the expansion of contracts and have mixed feelings about the higher limits. Many districts have been contemplating withdrawals from SAGE because they can’t afford it and while I believe 15 is better than 18, 18 is better than 22 or higher. In an ideal world (and in the plans put forth by the Wisconsin Alliance for Excellent Schools and the School Finance Network), districts wouldn’t have to make these choices. Even the Pennies for Kids proposal includes a Poverty Aid that would address most of this dilemma. One friend suggested a local policy that would seek to keep the 15/1 at the highest poverty schools and use some of the flexibility at lower poverty schools. I like that. The last item is “2010-11 MMSD Budget Reductions, Efficiency Options, and Other Measures for Addressing the Property Tax Impact of and Revenue Gap within the Projected Budget (action may be taken). ” The Budget Page is here (with a link to a summary of the actions they took last Monday, but not some of the documents linked above). This is as good a place as any to say few words about the MMSD Budget article that appeared in the Isthmus this week (a very few words). There is no question that there have been serious problems with the process this year. Some of this is because the the tax or cut decisions before the Board are very different from the traditional cut to meet the revenue limits decisions of the past. However, both the Board and the administration knew this in advance and I don’t think they fully thought out or implemented procedures that would make things as clear and smooth as possible. I hope some planning is done to make next year better. There is also no question that the timing and quality of information provided to the Board and public has been lacking in some significant ways. Work needs to be done to tighten this up also. The whole thing has the feel of a collective improvisation and a rushed one at that. This isn’t good. The one place where I think the analysis presented in the article is wrong is on the nature and size of the gap and the problems with the confusion around that. I’ve said before, “tax authority is tax authority, is tax authority” and there was a an over $28 million gap between the authority exercised last year (the “no new taxes” level) and the allowed authority this year. I don’t like the “no new taxes” formulation, but till the Board decides otherwise (as they did on March 22), that’s the baseline. There was also a slightly over $1 million gap between allowed authority and initial cost-to-continue estimates. When presented with this information, the Board asked for $30 million worth of options for cuts, efficiencies and savings. This is what the administration provided and this is the source of the “sky is falling” ideas. You can watch the press conference when this was unveiled and see that every attempt was made to clarify things, but the reality is that $30 million worth of cuts were on the table and until the Board was clear that they would exercise revenue authority above last years level (raise taxes) a forecast of a falling sky was part of the picture that had to be considered. A couple things on the Awards. I don’t know many of the recipients, but I want to give Sheryl Rowe (my younger son’s teacher this year) and Jill Jokela (who I often have disagreed with but have great respect for her dedication) special congratulations.